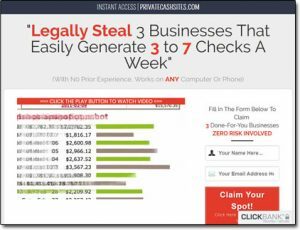 Private Cash Sites Is a Scam! 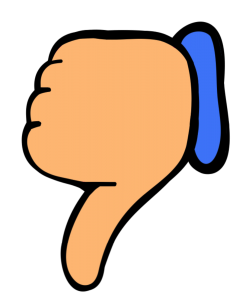 My Review Uncovers Why You Won’t Make Any Money! So basically in short you’re essentially led to believe that you’ll be able to sign up & begin making money right away through a “done-for-you” approach… But is it really legit or is Private Cash Sites just another scams that’s set out to part you with your hard earned cash? What Exactly Is Private Cash Sites? The headline of the site literally states that you’ll be “legally stealing 3 businesses that easily generate 3 to 7 checks per week” so it makes out like as soon as you sign up you’ll be able to begin making money… But surprise surprise signing up isn’t free. Instead, in order to find out more about how the whole thing actually works & to get access to the so-called “system” you’re required to hand over $47 of your hard earned cash – and I can tell you that this is a very common trait of a typical get-rich-quick scam. Couple that with the fact that the creator of the Private Cash Sites system doesn’t give any other information about himself other than calling himself “Josh” – things don’t look too good with regards to this system’s legitimacy. So the concept is that after handing over your $47 to buy into the Private Cash Sites program you’ll be getting provided with 3 done-for-you businesses created by Josh that’ll be setup ready to make you money. And this is where I’ll point out that affiliate marketing itself IS legit – however the Private Cash Sites program is NOT. The real truth is that instead of being set out to help you make money like it claims to be, the whole Private Cash Sites thing has just been set up to take money from you instead. I mean don’t get me wrong you can indeed make very good money online through affiliate marketing but in order to do so you have to set things up for yourself – though there are legitimate places like Wealthy Affiliate which show you exactly how to do this (and show you how to actually get started properly). Sure, they provide you with some done-for-you sites containing affiliate products as promised however as I mentioned the sites they give to all of their members are all exactly the same, meaning they’re duplicates. The bad news here is that search engines like Google, Yahoo & Bing do not list duplicate websites. It doesn’t make sense for them to do so as they’d just be repeating the results within their listings… And it’s these search engines that provide most webmasters with the majority of their visitors. So you’ll be getting “done-for-you” sites from Private Cash Sites but they won’t be getting listed in the search engines so you won’t find yourself making any dosh. Instead you’ll be told to use paid advertising to promote them, but as a newcomer this is VERY risky business. But there is some good news – like I mentioned previously in this review there is a legitimate place called Wealthy Affiliate where you can actually get a free website & learn how to get free visitors from search engines which can in turn make you money. If you truly want to make good money online then that’s the place I recommend you join instead of Private Cash Sites. And let’s just say when checking out the Private Cash Sites income disclaimer I found out some pretty alarming stuff. Firstly on the homepage of the Private Cash Sites program the income disclaimer at the bottom of the page refers to the program as Explode My Payday – and that was another scam which I previously exposed on this blog. But it doesn’t stop there as after actually clicking on the disclaimer link the website is then referenced as Your Freedom Mentor which once again is yet another scam that I exposed on this blog. So it seems that whoever is really behind the Private Cash Sites program is also the same person that’s behind all of these other make money online scams – and just yesterday I exposed another system named Click Click Cash which shares major similarities to PCS, so in my opinion it’s likely that they’re also behind that one too. Basically whoever they are I would not trust any of their programs (including PCS) as the links between all of these different scams makes things seem very suspicious indeed. I can tell you with all of my years experience at working online that this is hands-down not possible. I mean sure, like I mentioned several times throughout this review it’s certainly possible to make money online however the internet is not magical & you’re not going to start earning large sums of money overnight. The only money you could earn “quickly” is miniscule amounts from the likes of paid surveys & such, but that’ll only earn you a couple of dollars per day – it won’t get you anywhere near a full-time income. Instead if you want to earn a full-time income online you must be prepared to put in some hard work & not expect to earn anything for at least a couple of weeks or even months… That’s just how the game goes. My Verdict – Is Private Cash Sites a Scam? Ultimately this depends on your definition on a scam, but in my personal opinion yes it is a scam. The reason I say that is because whilst it might not “steal” money from you, it is very misleading & what you end up purchasing is not going to live up its promises. To be completely honest I would be very surprised if so much as one single person that buys into the Private Cash Sites program ends up making money because as far as I’m concerned it’s just purely geared towards making it’s own creators wealthy at the members’ expense. The sales page is jam-packed full of lies, the opportunity is totally hyped up & everything is made out to be much easier than it actually is. Sadly it’s only after parting with your cash that you’re left to discover the truth & that’s why in my opinion I believe it to be a scam. If you really want to get started online & make good money then you can actually do it for free. I’ve even put together a guide on starting a profitable website for free right here on this blog which you can check out here. And on top of that there are also several other excellent ways to make good money online. Is Bitpetite a Scam? Review EXPOSES It! Online Cash Bonanza – Scam or Legit? My Honest Review Exposes The Truth!